You know the person sitting across from you on the T who's laughing out loud to themself and then awkwardly trying to cover it up with a a mix of smirking and frowning? Yeah, that's me. There's nothing wrong with me, I assure you, but the idea of David Sedaris playing favorites to the myriad of spiders living in the window of his country home can't be contained and I find myself laughing out loud much to the annoyance of those smooshed against me on the T.
I'm also the person who protectively covers the next page in the book so that the person sitting beside me can't see what I'm reading. It's not just because the content makes me blush (as is currently the case with the Gabaldon series) but because I feel like reading is a bit of a private thing. Sometimes it is about the book. When I read the Twilight series two years ago I kept the book pressed to my body hoping no one saw what I was reading. I mean, I wouldn't want anyone to know that I too got sucked into the high school love triangle between a human, a werewolf and a family of vampires. I'm twenty-six after all, not thirteen. Luckily that was before the series ballooned so no one paid me much notice. But I'm also protective because I feel like a book can be such a personal thing - a journey between you and the characters. Maybe I'm weird, but I get sucked in from the moment I open the cover and tune out everything around me. I've almost missed my stop a few times. Friday night I was on the T for only two stops on my way to meet up with a friend for dinner. 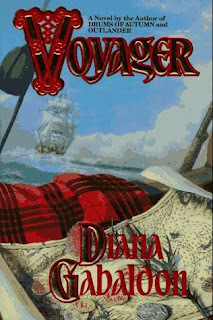 I knew I only had about five minutes but I was ten pages away from completing "Voyager", the third book in Diana Gabaldon's Outland Series. I opened the book, tuned the world out and set to work. It's a trifle sad at how obsessed I've become with this series. I just have to know what's going to happen next, even if it means coming home from a bar and crawling into bed with the book no matter how tired I may be. I was hunched over the book, completely tuned into 1767, when the woman besides me startled me back into reality. "I have to ask, how are you enjoying the book?" I looked down at the faded 1994 copy pressed protectively to my lap to shield the tartan cover and wondered how on earth from two seats over had she figured out what I was reading? "I'm loving it," I responded rather embarassed. "Is this your first time reading them? That one is my favorite in the entire series and anytime I'm in the mood for some romance I pick that one back up. And I cry every time too, it's just so heartwrenching. Jamie and Claire are two of my favorite characters from any books I've read," she gushed much to my amazement. Two things struck me from this conversation that went on until I arrived at Harvard Square. 1.) I am the biggest cryer you will ever meet. The first time I saw a preview for "The Blind Side" my friend Molly turned to me at the end of the trailer and asked rather astonished, Are you crying? No, I sniffled and wiped at my face. There's currently a Folgers commercial that makes me tear up every time I see it. You get the idea. But I haven't shed a single tear and I've already got almost three thousand pages of this series under my belt. Perhaps it's because I'm very cynical when it comes to romance, who knows. It's not that I don't feel for the characters' relationship because I do. I really do. I loooove their relationship and would revel in finding one similarly (without all the drama of clan wars, running from the British, etc). Either way, her comment made me feel like I'm missing something in the reading. Or maybe I need to ask the Wizard for a heart. 2.) I feel like I now belong to this secret band of women who pine for James Alexander Malcolm Mackenzie Fraser. I know the books have been around for nearly two decades but it just surprised me to know the person beside me on the T had also embarked on a journey through time and across oceans with Jamie and Claire. Clearly I am not alone in my newfound obsession. Anywho, if you haven't picked up Outlander, you really should consider. You too can become a Gabaldon Groupie and it's a tad more acceptable than fantazing about a 17 year old vampire (or werewolf if you're Team Jacob). Just saying.